We’d love your help. Let us know what’s wrong with this preview of Silent Subversion I by Hyrum E. Jones. Excited by her discovery's potential to revolutionize the world, and possible vengeance for her brother's death in Iraq, Taylor Ewell calls an old friend from college for advice, a lawyer named Gerald Fuger. Together, they secretly begin recruiting a specialized team to help develop and introduce her new technology. But after getting to work, unforeseen circumstances thrust them from the familiar world, into a place more amazing and horrific than any of them knew existed. Not only must they dodge imprisonment, they must also counter the interference of a mysterious force. 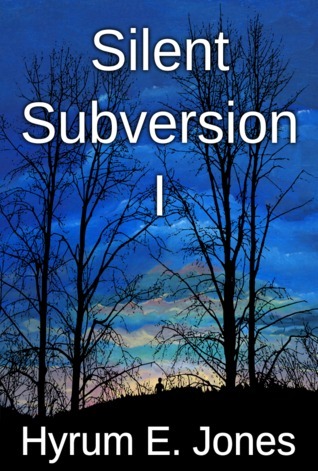 To ask other readers questions about Silent Subversion I, please sign up. Silent Subversion is not my usual reading fare, but I thoroughly enjoyed it. It is difficult to classify with just one genre. While it is mostly science fiction, there are also elements of drama and mystery. Silent Subversion encourages the reader to look behind the curtain and see what the wizard is really up to through social commentary and religious allegory. I would recommend this book for a more mature audience. Unfortunately it took me a lot of time to get into the book - BUT not because of the story but because I didn't have time to sit down and read (such a sad time!). So when I finally found the time I.COULDN'T.STOP! such a GREAT book! The book is split in parts and the chapters are always from another characters perspective. I don't want to write too much about the book itself as it is difficult to put this great book in a review. The story is really well written and everything is explained - you feel that Hyrum E. Jones took his time to create such a perfect story! Thank you to Hyrum Jones for sending me a copy of this book as part of a Goodreads Giveaway! It was much appreciated. I need to be honest that I suspect this book is probably a love or hate sort of story, and I unfortunately did not like it even one bit. It took a month to get through, and it was very painful. "A group of angr Thank you to Hyrum Jones for sending me a copy of this book as part of a Goodreads Giveaway! It was much appreciated. "A group of angry libertarians have an invention that promises them the ability to leave Earth to be with 'people more like them' and not 'the masses' who accept government corruption and manipulation through regulations and taxation. They experience some extra-terrestrial phenomena that adds an element of 'weird' to their goings on, and they've got an awkward relationship with the FBI." For the record, the characters are also all annoyingly one-dimensional and one-track-minded. I don't recommend this book for anyone who isn't from the United States or Mexico, because it really just doesn't connect to the philosophies of governance and society in many other places. All thank you for Hyrum E. Jones and of course Goodreads for the signed copy! When i found the pack in the mail in a morning, i become so excited for read, i'm naturally attracted for Sci-Fi books, and the author made a really great job. I'm finish the book in a very fast mood, by the way i can sit and reads a lot of pages for hours. I love the way that the characters come on the storyline and the fact that every chapter starts with a quote. The story have elements of drama and i adore it! Looking f All thank you for Hyrum E. Jones and of course Goodreads for the signed copy! characters Taylor, haha, and a little bit Freddy after the story progress. If you love Sci-Fi, drama and mistery, read this book! Oh, and if its not your book taste read it anyway, haha, its a good choice to come out of your confort zone of literature. And i really recommend this too for the mature readers, i think is a story complex at same time, and this is good, the author take it to heart. I'm again saying the author made a amazing job, i can't wait for the next! Yay, please a next book! And thats is a prove that won me over.